Crafted to provide precise feedback to young riders, the Chromium Molybdenum steel frame is made using advanced robot welding and hydroformed tubes. 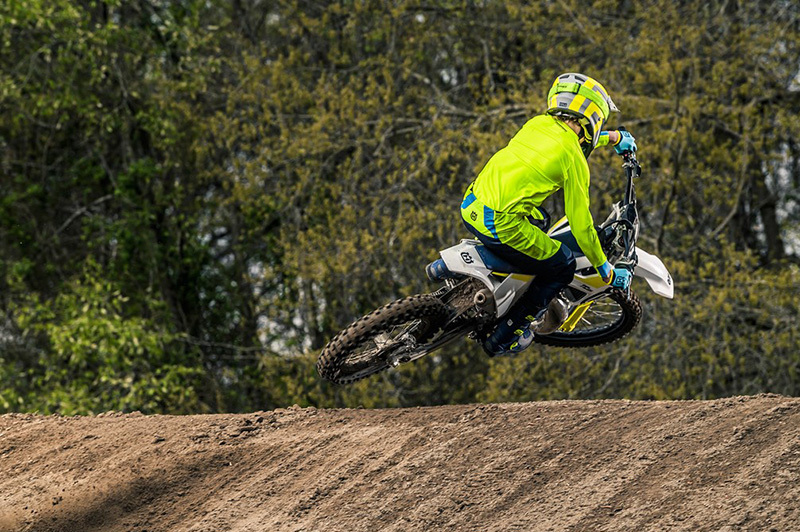 Much like the forks on the larger MX range, the WP AER 43 consists of a split fork design using a capsulated air spring in the left leg and the trusted oil damping system in the right leg. These components offer remarkable suspension performance with 280 mm wheel travel. The WP XPlore PDS shock absorber is fitted to the TC 85. PDS meaning "progressive damping system" allows the rear end to stay stable over smaller bumps or rough terrain while also soaking up bigger hits with ease. Made from lightweight aluminium, the subframe features a short and compact profile. The profile not only contributes to the overall low weight but also improves mass centralisation. The TWIN AIR filter can be easily accessed without tools, by simply removing the left side panel for quick maintenance. The airbox design allows optimum airflow and maximum filter protection. The TC 85 features radiators designed with computational fluid dynamics to ensure the ideal passage of air through the cooling fins for optimum engine temperature and the highest performance. 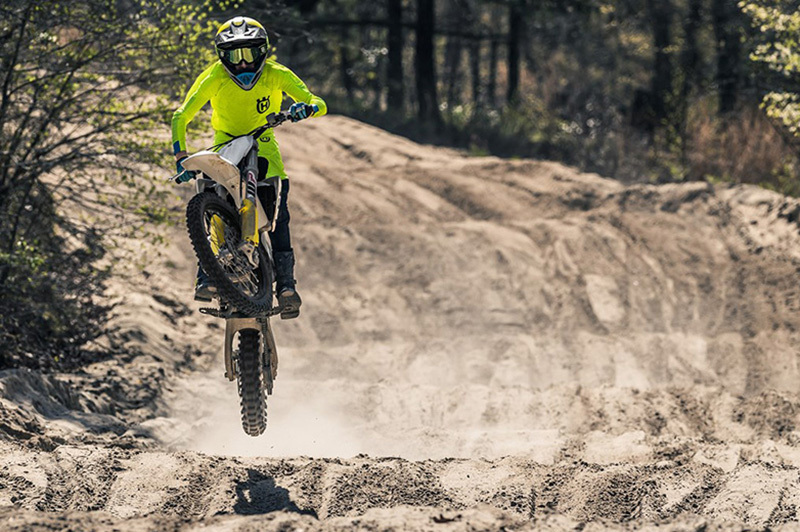 Manufactured using a gravity die-cast production process, the one-piece aluminum swingarm offers exceptional strength at the lowest possible weight. For easy maintenance, the chain adjustment markings are visible from above making chain adjustment even simpler. 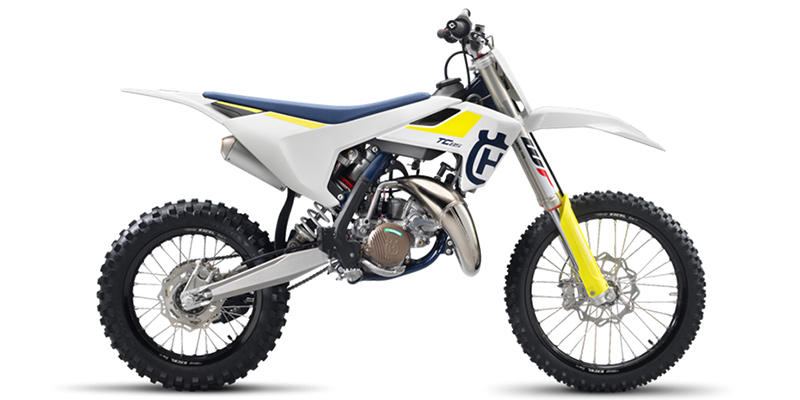 The exhaust system on the TC 85 is perfectly suited to the power characteristics of the engine and contributes to the outstanding performance and rideability all round. Additionally, the short and lightweight silencer improves mass centralisation while keeping noise levels to a minimum. 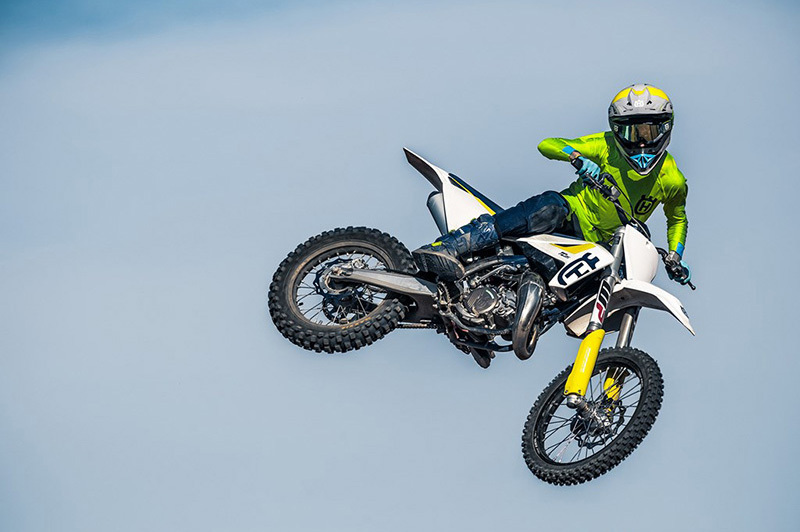 The TC 85 engine uses the latest in 2-stroke technology to deliver unrivalled performance in the competitive 85cc class. With an unchanged bore and stroke, the engine is1.5 pounds lighter and delivers improved power and ride-ability along the complete RPM range. The cyliner is designed around an innovative power valve system, the system controls both the exhaust valve and the sub-exhaust port for impressive power, torque and controllability. 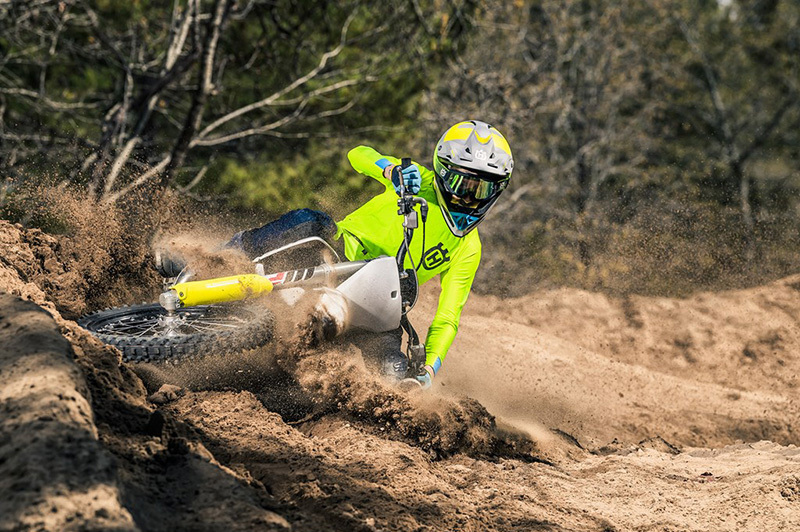 As a result, the TC 85 delivers significant mid-range performance, reducing the need to use the clutch in loamy or sandy conditions. Manufactured using a high pressure die-cast production process, the crankcases are designed with thinner wall thickness to save weight, while retaining strength and durability. This design also aids in a more compact arrangement, positioning the shaft arrangements closer to the centre of gravity for improved handling. Replacing the previous coil spring design, the TC 85 features a new diaphragm spring clutch. The new design is 1 pound lighter, more compact and also benefits from added durability. The clutch is actuated using a formula hydraulic system meaning that play is always compensated for and the clutch point remains the same under different conditions as well as over time. The TC 85 is fitted with high quality ODI lock on grips standard. The system includes a vulcanized grip on the right side while the lock on grip on the left does not require glue or wire for mounting. Black Excel rims and CNC machined hubs are fitted with Maxxis tires that deliver outstanding performance on a variety of terrain. The block pattern and rubber compound deliver exceptional straight-line stability and excellent traction and predictability. 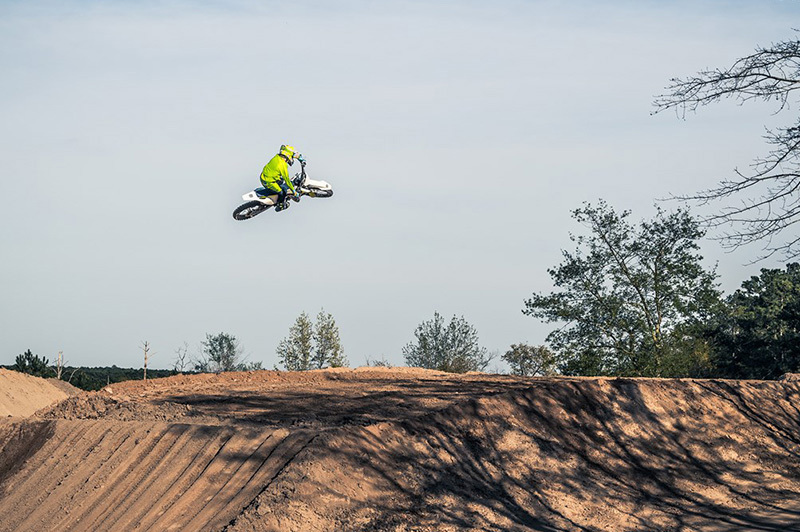 The TC 85 features bodywork scaled to precisely fit the proportions of an 85 rider. The contact points and feeling deliver exceptional ergonomics, instilling confidence while also leaving room for free and unrestricted movement. A Formula four piston brake caliper and 240mm wave disc up front, and a two piston calliper and 210mm wave disc at the rear ensure powerful and confident braking. The piston size on the rear caliper is reduced by 2 mm to 22 mm and in combination with a new rear brake lever provides improved modulation and feeling.